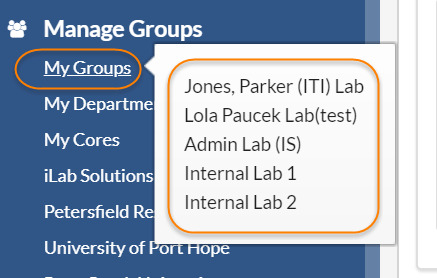 The Lab/Group interface is the central hub for PIs and Lab/Group Managers to manage the Lab/Group members, access to funding, monitor budget and modify various settings. In iLab, every user must be a member of at least one Lab/Group to be able to order services and make reservations. View Requests‍: Filter and view all service requests placed by members of your group. Invoices‍: Review all invoices for service requests and reservations made by your group. Reporting‍: Generate reports for iLab activity of your group.